Adjust the weight of the kettlebell to 10,15,20,25,30,35 or 40 pounds! Purchasing 7 different kettlebells would normally cost $400 plus! 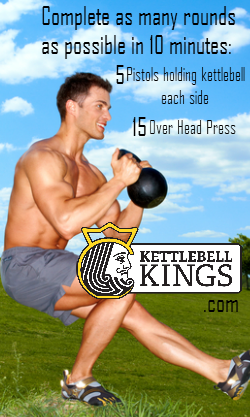 This is the most versatile kettlebell we offer. The weighted plates in the kettlebell can easily be unlocked and removed to adjust the weight of the kettlebell to 10, 15, 20, 25, 30, 35 or 40 pounds. There is really no kettlebell exercise you cannot do with this kettlebell because of the weight flexibility. If you are relatively new to kettlebells or weights this is the most perfect kettlebell for you. It answers all the questions you might have about which weight you need to start with or which weight to do different exercises with. You can easily perform high rep or low rep workouts of the same movement by simply adjusting the weighted plates with the slide of the lever! Also, see our other Adjutable Kettlebell models! Here are some workouts you can try with this kettlebell!